Essex, Vermont—September 9, 2011 Phoenix Books and Cafe added a new color to its palette with the launch of The Gallery at Phoenix Books. Owner Mike DeSanto says, "The addition of works from artists across Vermont positions us as an art gallery. Works by Vermont painters, photographers, and craftspeople are for sale." The Gallery at Phoenix has joined the Vermont Crafts Council, and will focus is gallery on Vermont artists and artisans. Phoenix is participating in the inaugural Foliage Open Studio Weekend on October 1st and 2nd, sponsored by the council. Foliage Open Studio Weekend marks the grand opening of the gallery, but only the first step in what DeSanto hopes will be a successful series of art shows: "Over the next year we'll host about six art shows, each with an opening reception and exhibition." The Gallery builds on Phoenix Books' long-standing relationship with the Essex Art League (EAL) - whose works they've exhibited since the store opened in 2007. "Phoenix Books gave the artists of the EAL an outstanding opportunity,” says Michelle Jackson of the EAL. 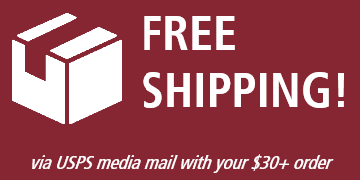 “We’ve made many sales - and customers have brought home original pieces of artwork to enjoy. Mike is extremely supportive, and it’s wonderful to have a local place to share our art." 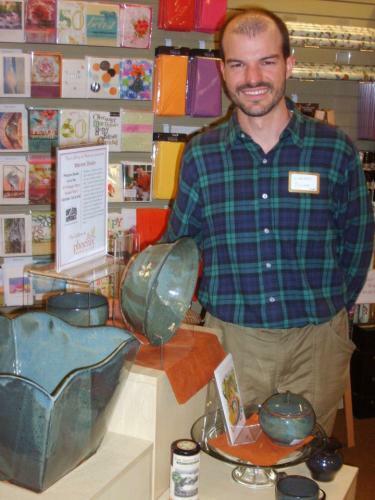 Phoenix Books features pottery by Vermont artisans Judith Bryant, Warren Dixon and Lynn Flory. "I've always been very interested in art, and I already own pieces by Judith and Lynn, and a painting by Essex artist Lucia Chu," says DeSanto. "The level of talent and skill is simply amazing in our own community. Vermont artists rival any in New York or Boston." 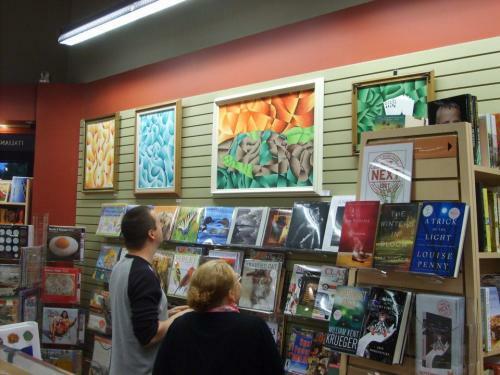 The Gallery at Phoenix Books is actively considering artists and artisans. Anyone desiring to supply works on a consignment basis should call Mike DeSanto or Colleen Shipman at 872-7111. "I'm interested in seeing some three-dimensional works as well," says DeSanto. The gallery comes highly recommended: “I’m honored to be a part of this independent bookstore,” says Warren Dixon. “They creatively display my work and are extremely helpful with the logistics of selling my pottery." DeSanto believes the commitment to sell functional and fine art puts Phoenix in a unique position among bookstores: “This is a lot more than hanging paintings by local artists on a wall, as you see in a restaurant. This is about making a commitment to artists to expand their reach into a new community. Phoenix Books stands behind this effort by featuring these local artists in our newsletter, within the store and as part of our overall marketing effort. "You can see, taste, touch and hold everything we sell here - unlike the virtual stuff online. Having a bookstore, with a cafe offering beer and wine and displaying beautiful works of art...it stimulates all of our senses. I proudly say we're for mindful, thoughtful people - without being elitist or snooty! After all, you need to make a thoughtful choice just to visit our bookstore. I want to invite all art lovers to walk through those doors and see for yourselves how these works enhance and energize the physical space. It is quite transforming." 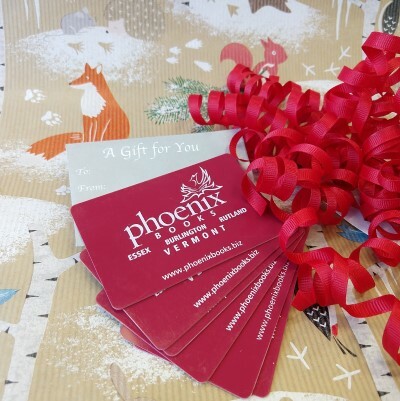 Great literature and well-crafted stories aren't the only arts and crafts you'll find at Phoenix Books and Cafe at the Essex Shoppes and Cinema. The store has, since its inception, housed fine art from members of the Essex Art League. Now, Phoenix is also home to a world-class trio of Vermont potters, namely Judith Bryant, Warren Dixon, and Lynn Flory. Bryant has lived and created fine porcelain and stoneware pottery in northern Vermont for over 35 years. "I'll always be fascinated by...the alchemy of transforming fluid clay through fire into pottery," says Bryant. Monkton's Warren Dixon adds, "Who doesn't like to play with mud?" He emphasizes the functionality of these works of art, positing that "... hand-made pottery creates an energy with the food that is simply not achievable eating off mass-produced dishes." Native Vermonter Lynn Flory studied with world-renowned potter Otto Heino, and says she moved back to her home state to "be surrounded once again by beauty and to dedicate myself solely to the art of pottery. Since then, miracles have happened." Work by all three artisans is on display and for sale at Phoenix Books & Cafe. For more information, please call 872-7111. Click here to see Phoenix featured by PW. "As of October, Essex, Vermont, once again has an independent bookstore..." Read more. "Renee Reiner, owner of Phoenix Books in Essex Junction, remembers being “smitten” with Marty Galvin, her high school English teacher at Walt Whitman High School, in the late ’70s." Read more. Did you miss the event with Michael Hastings? Check out this vid from the Essex Reporter. 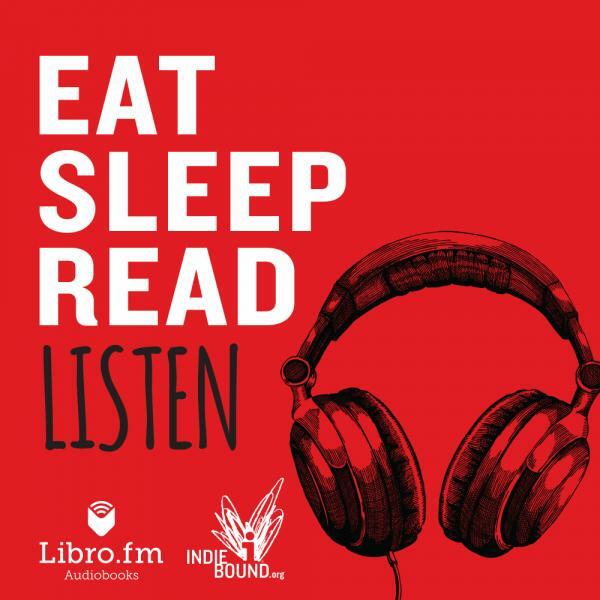 Listen in to this great show, including a recommendation of our own! Check out Mike's recommendations for summer reading!